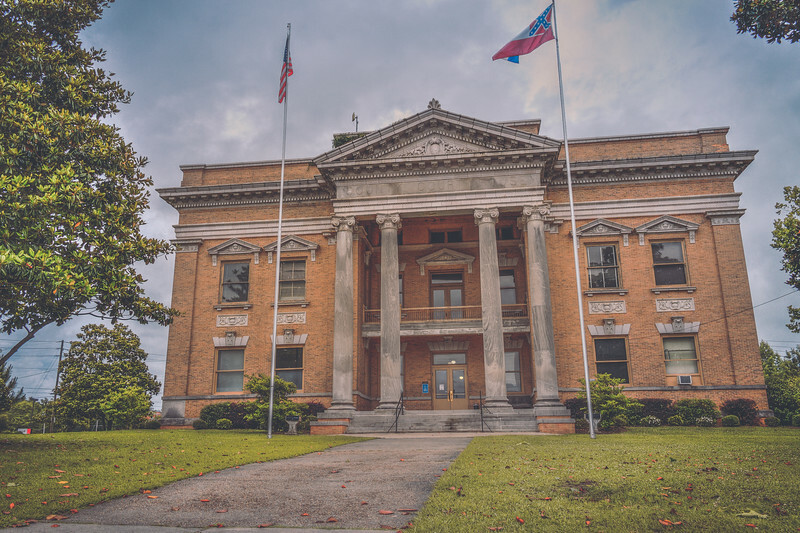 Here one Jones County's courthouses located in Ellisville. Ellisville and Laurel are both county seats, so I assume there is also a courthouse in Laurel. 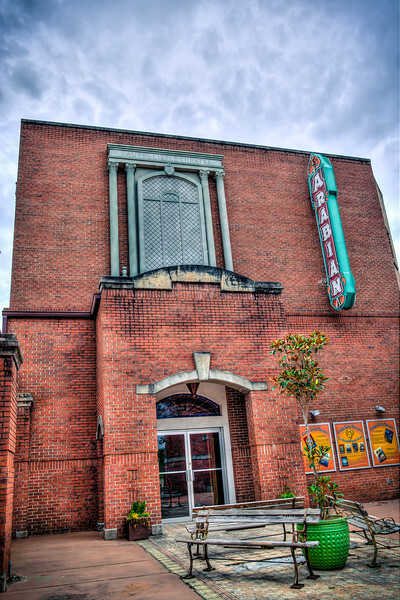 This is located on Ellisville's square which also is home to a really nice old Presbyterian Church. It's unfortunate that many times, when I'm traveling through towns and photographing various places, the restaurants are closed. These little local joints usually have pretty good food, and I hate that I might be missing out on some of them. 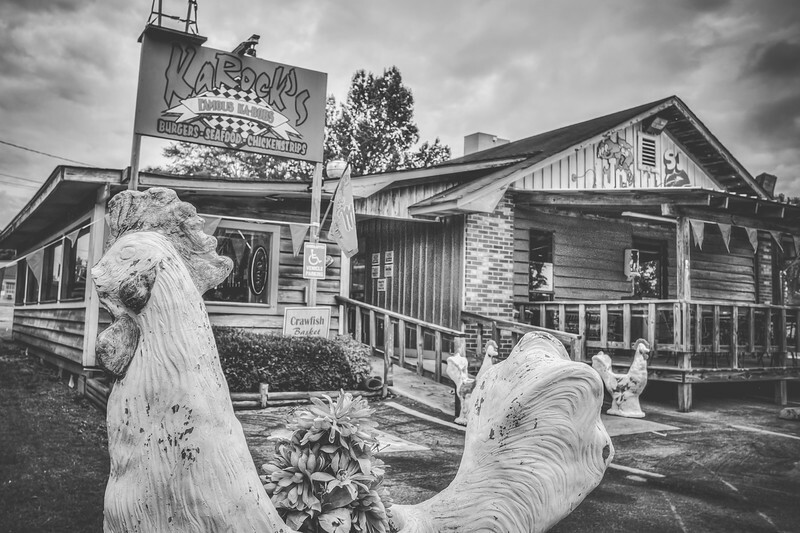 KaRock's looks like a good place with a variety of food choices. I'm sure it's healthy food too right? 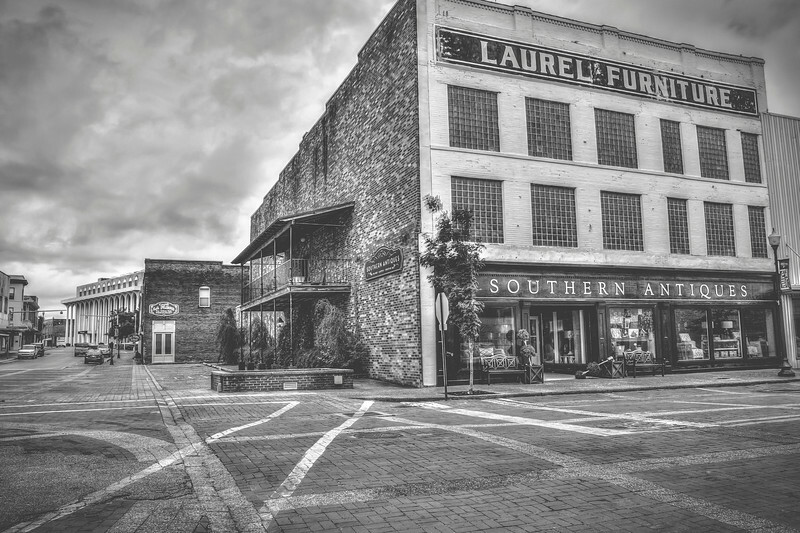 Downtown Laurel is a pretty cool place and I took this photo on my first every visit to that part of Laurel, though I've driven through Laurel many times, but only on the highway. 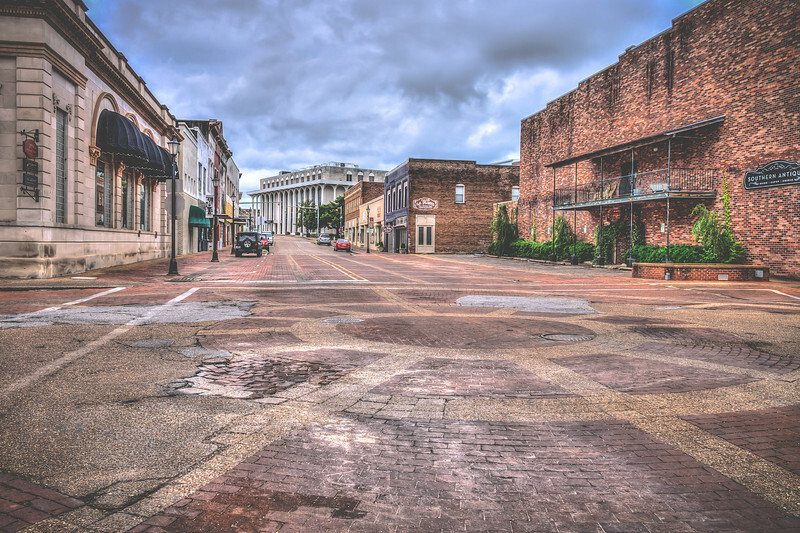 I'm sure Mississippi has many more great downtown areas that I have yet to see. I loved the brick intersection in front of this building. If you go back and read my early blog posts on this site (it's been almost a year now, by the way) you will see that I don't have expensive eqipment. In fact I have not even invested $1000 in my camera and lenses combined. I am a firm believer that you can get as much out of "lesser" equipment if you use it right. Having said that, another thing that has helped me in my photography journey is my ability to use Photoshop well. I have been using Photoshop since around 2000 being a Graphic Designer student and also working professionally as one since college, so I have learned lots of tips and tricks that are helpful in photography. With Photoshops vast tools and uses I am continuing to learn new things even today. So why am I telling you these things? Because of this photo. I have been wanting to capture some long exposure shots, but the equipment that I have is not very condusive to long exposure photography, so my solution was to create my own long exposure shots after the fact. My first example of that was in this photo of downtown Columbus. Using my photoshop skills I carefully made the sky to look like moving clouds. I won't go into detail about exactly how I did it, but hopefully in the near future I can make a video tutorial of the process. Like I said, it's all in how you use what you have. And, by the way, I love downtown Laurel. 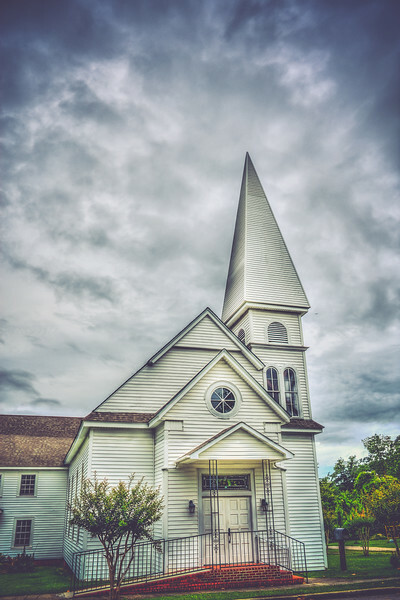 I really liked this church, especially against the clouds in the sky. The bell tower on the church is really nice. It is so intersting to see the different types of architecture used on churches across the state and I contantly find myself photographing them. Laurel has a great downtown full of nice architecture. 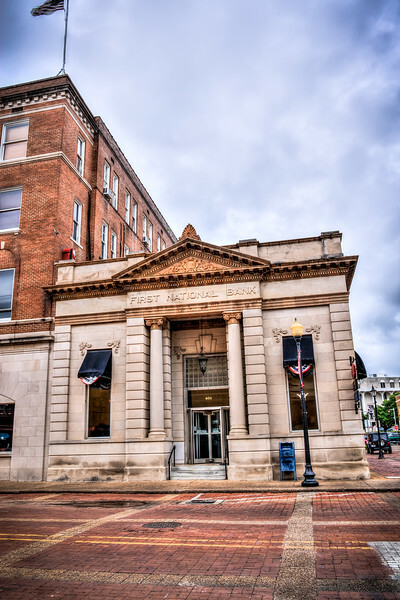 Most Mississippi downtowns have an old bank building (sometimes not used as banks anymore) and they always look so sturdily built and secure with thick concrete and ornate columns and trim. I love new buildings too, don't get me wrong, but this type of architecture just looks so well crafted and unique. 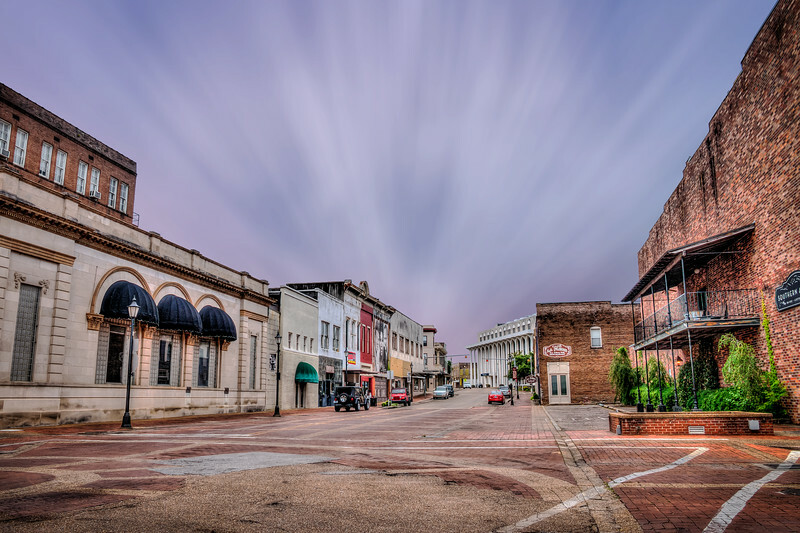 I really loved the downtown area of Laurel and its brick streets. Next time I'm there I plan to just get out and walk the whole downtown and get more photos. Very cool place. I thought this was nice scene in this courtyard area entrance to the theater. I would love to see the inside. I love Laurel's downtown area. Lots of historic buildings and brick streets. Next time I'm there I'd like to just take a walk around and get more photographs. 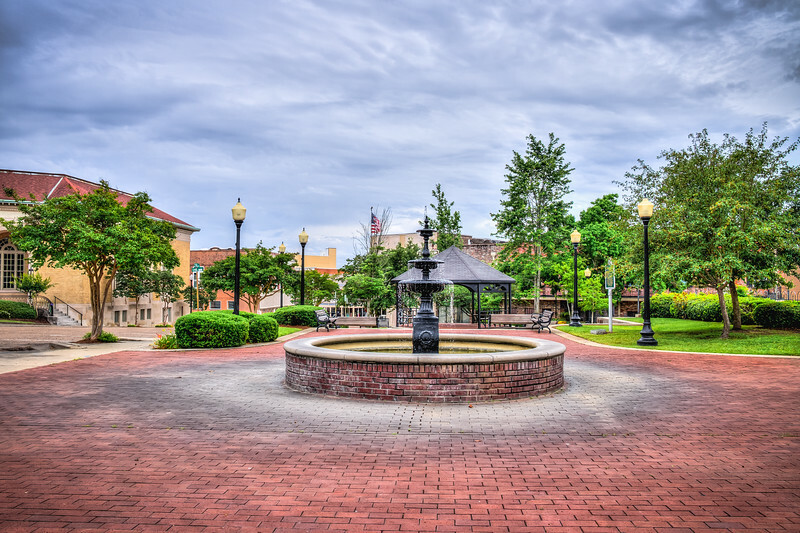 It's my favorite thing to do, when time permits, to take a stroll around a downtown area and really get to see up close all that it has to offer.